This post was originally published June 8, 2009. Updated 5-17-16. It’s been a really long time since I baked a cake. I don’t even remember the last one I did bake. So, last weekend I thought it was just time for one. And what could be better than a good old Red Velvet Cake? With all that yummy cream cheese and toasted pecans. How can you resist something like that? Perfect description of the luscious Red Velvet. Grease and flour three 8-inch cake pans and set aside. You could use two 9-inch pans, but I think the 8-inchers make a prettier cake. Whatever floats your boat. 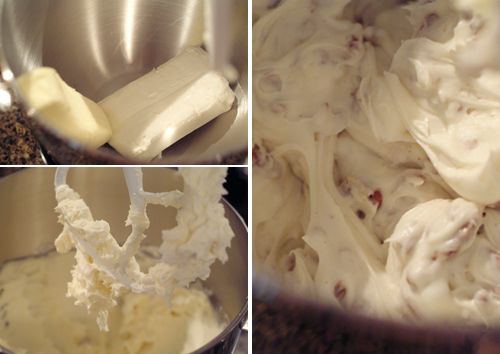 Cream together the shortening and sugar until fluffy. Add the eggs, one at a time, beating well after each addition. Continue beating for 1 minute on medium speed. 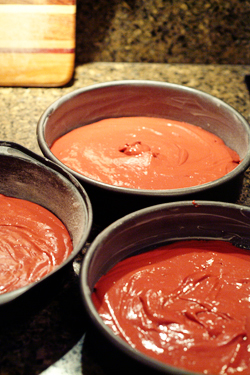 Add the cocoa and red food coloring to the creamed mixture. Folks, let me tell you that red food coloring and KitchenAid mixers have no respect for your kitchen cabinets, countertops, nor your clothing. More shirts have been ruined while making Red Velvet cakes. So, when I get to this step, I turn off the mixer and very gently and easily stir the coloring in by hand. Some people make a paste of the cocoa and food coloring and then add the paste to the creamed mixture. That also helps prevent splashing of the red food coloring. Of course, it helps if you’re not the world’s biggest klutz. I just happen to be. Add the vanilla to the buttermilk and set aside. And there’s my Albany Drug Co. vanilla again. Unless you grew up in or around Albany, Georgia, you’ve probably never heard of “Albany Drug Co. Vanilla.” It has to be the best vanilla I’ve ever used. Period. It has a strong vanilla flavor, but there’s something more to it. A sweet, almost smokey (as in cigar kind of smokey) smell. I really don’t know how to describe it. It’s just something you have to experience. Anyway, Albany Drug Company made this vanilla for years and years. As long as I can remember. Sadly, Albany Drug Company no longer exists, but the vanilla lives! It is still available from U-Save-It Drugs. They’re still making it just like Albany Drug always did. So, if you ever find yourself in southwest Georgia near Albany, run by U-Save-It and get yourself a bottle of the vanilla. You won’t regret it. By the way, I have no affiliation whatsoever with Albany Drug Company or U-Save-It Drugs. They have absolutely no idea who I am. I just like their vanilla. Sift the flour together with the salt. Alternately add the flour and buttermilk to the creamed mixture. Blend the vinegar and baking soda and beat it into the mixture. Sorry I don’t have a picture of the baking soda and vinegar reaction but it happens so fast you don’t even have time to pick up your camera. If you have little ones around your house, call them in when you start to do it. They’ll love it. All that violent fizzing really excites them. Divide the batter between the cake pans and bake 20-28 minutes. I know that’s a big time difference, but it depends on your oven, the weather, and lots of other stuff. Just start checking it at about 20 minutes. Remove from oven and allow to cool in pans for approximately 10 minutes. Turn out layers onto a rack to cool completely. There’s no way to mess this up. You just basically dump it all in the mixer together and crank it up. Beat the butter and cream cheese until light and creamy. Add the vanilla and confectioner’s sugar and beat well. Stir in the pecans. Prepare your cake plate or pedestal. I like to put some strips of wax paper around the edges to keep the plate clean while I frost the cake. I tend to not be the neatest cake froster. Also, I put a little dollop of frosting on the cake plate to help hold the bottom layer. It keeps it from slipping around on the plate. Spread frosting between the layers, on top and sides of cake. Sprinkle top with additional toasted pecans. See how clean and neat that cake plate is? I told you. 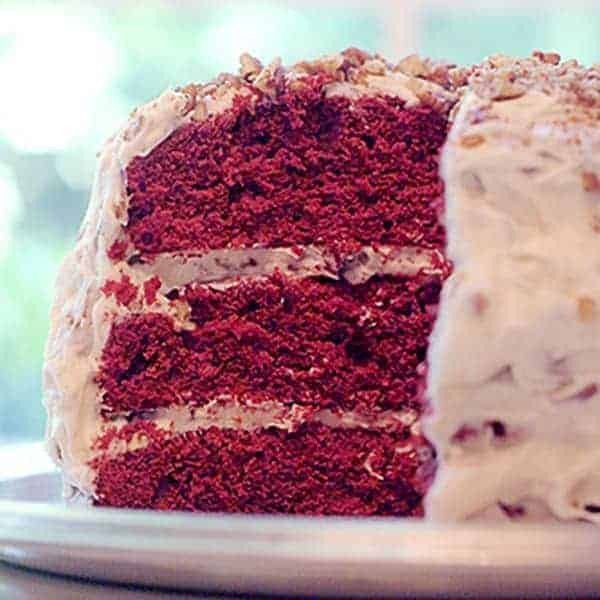 Traditional, southern, delicious, red velvet cake. Preheat oven to 350 degrees. 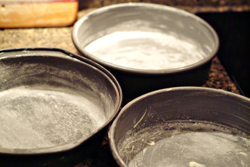 Grease and flour three 8-inch cake pans and set aside. Add the cocoa and red food coloring to the creamed mixture. Note: some people make a paste of the cocoa and food coloring and the paste to the creamed mixture. It helps prevent splashing of the red food coloring. Add the vanilla to the buttermilk and set aside. Sift the flour with the salt. Alternately add the flour and buttermilk to the creamed mixture. 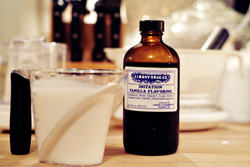 Blend the vinegar and baking soda and beat it into the mixture. 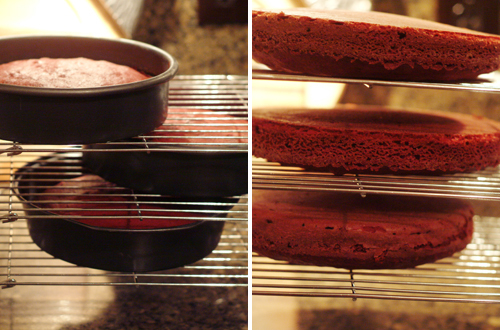 Divide the batter between the cake pans and bake 20-28 minutes. Remove from oven and allow to cool in pans for approximately 10 minutes. Turn out layers onto a rack to cool completely. Beat the margarine and cream cheese in a medium mixing bowl until light and creamy. Add vanilla and confectioner’s sugar and beat well. Stir in pecans. Spread frosting between layers, on top and sides of cake. Sprinkle top with additional toasted pecans. This looks incredible. I love red velvet cake. By the way, I love your title of your blog….. Yum!! I love red velvet cake. That looks very tempting right now. Ohhh man … u’re right abt it being the Dolly Parton of cakes … but I’ve always had a soft spot for Dolly! 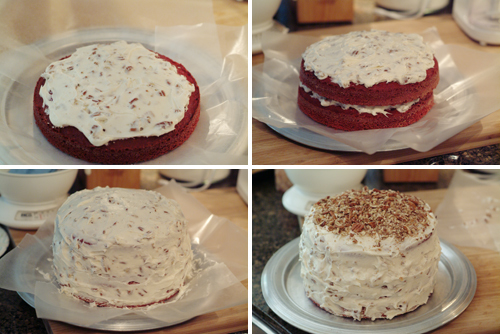 Your red velvet cake looks divine … truly … me crave! 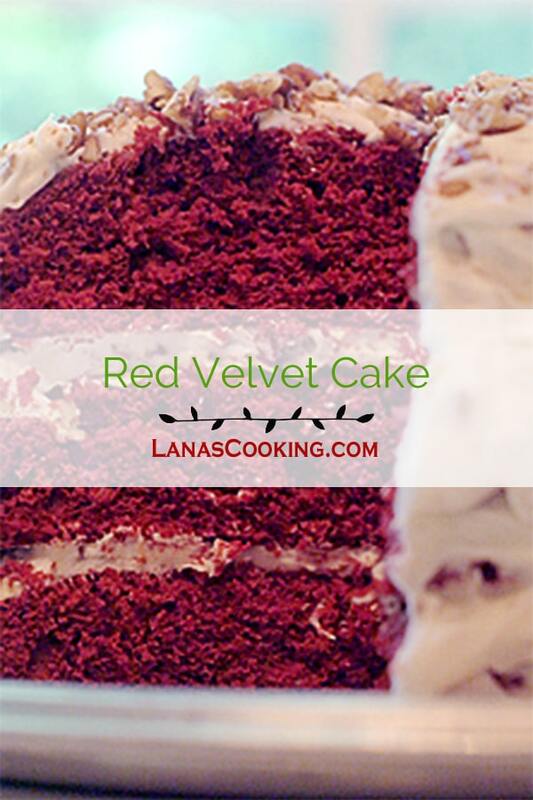 Red velvet is one absolute favorite cake! Speaking of origins, I heard I think on TV that red velvet came about during maybe WWI (or WWII can’t quite remember) when there was a ration on cocoa powder. Some chef somewhere had not enough cocoa to make a decent chocolate cake so instead he compensated by putting in red food coloring and calling it a whole other type of cake! Absolutely beautiful! This cake looks luscious. What a gorgeous picture and one of my favorite cakes! Have you ever noticed how Red Velvet cake is the first thing to fly off of the dessert table at a covered dish event? Folks will actually elbow one another to get to it. This cake has magnetic attraction — folks are absolutely drawn to it! Your rendition is absolutely perfect. But, don’t take it to a covered dish supper, unless you alert the riot police first. I absolutely love red velvet cake. I made it for my daughters 1st birthday and it was a huge hit. Red Velvet Cake is so good. I’ve had it before. This one looks so good. When I was in Charleston last summer I had a Red Velvet Cupcake at Cupcake! So good. The red originally came from beets I believe. Easy to achieve without the artificial colouring. Hello Lana , First of all thank you for this amazingly looking velvet cake . Secondly , I tried baking it but I hated the taste of vegetable shortening ! I don’t know but it tasted awful :( . Can I try baking it with butter instead of vegetable shortening ? and the crust was dry , how can I get a fluffy tender cakes ? Sure, Aysha, you can try this recipe with butter. Let me know how it turns out. Not sure what you mean when you say the crust was dry…do you mean the layers were dry? If so, you probably overcooked it. And I’m sure you could make cupcakes from this. Adjust your baking time accordingly. Thank you Lana , God bless you . I’ll try it again today and I will let you know how it turns out . Now you have a red velvet cake. I enjoy your lively posts, as always and especially like this cake! What a beautiful red velvet cake!! I don’t bake cakes nearly enough! Ok, it’s a few years later, and I still want this cake. Really.